Happy Leap Year, Happy February 29th! 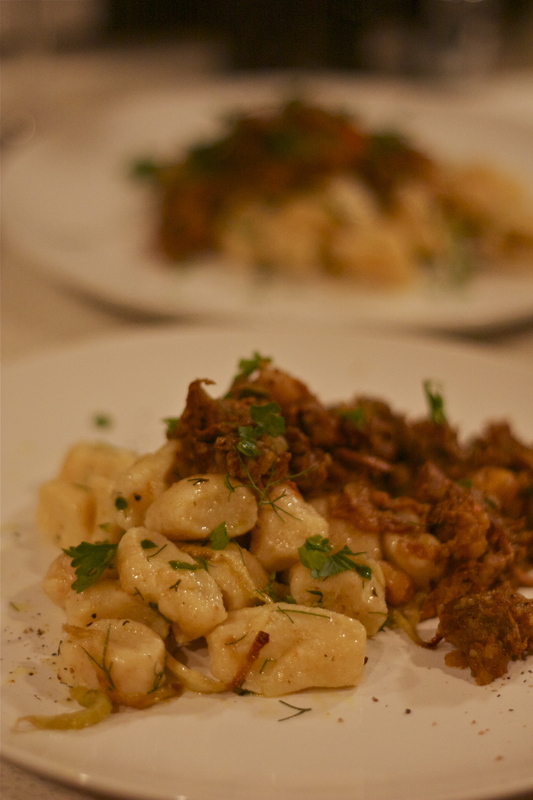 An Argentine tradition I love is eating gnocchi (ñoquis) on the 29th of every month. Unfortunately, making potato gnocchi is a pain in the tush. Fortunately, ricotta gnocchi makes my life simple. Option 1: Hacked open with a machete by a roadside vendor who’s carting a string of coconuts along on his bike. (e.g., Left @Karnataka, India.) Option 2: DIY. As a kid, we used a Phillips head screwdriver and a hammer to puncture a few holes in the coconut and up-end it over a glass to drain the water. (2) Access to Coconuts Not too long ago, my family bought whole coconuts from specialty stores. Most Midwestern markets only carried coconut flesh, either in cans or sweetened & shredded in bags. (3) Price Coconut water at the store was $3. A whole coconut costs less. 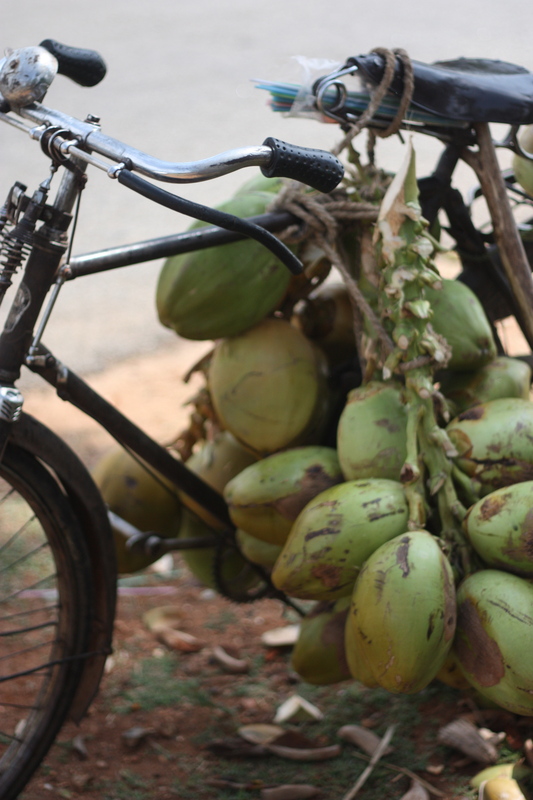 Roadside in India, it’s likely closer to $0.20 to get an entire coconut sliced open & served with a straw. (4) Nutrition Coconuts generally don’t come with nutrition labels. We were both surprised at the high levels of potassium and low sugar content. “No additives?” My dad was suspicious. Nonetheless, my dad managed to drink half of my coconut water, then told me it was too expensive and complained it didn’t taste as fresh as it should. Today, when I bought another box, he happily stole another half of my coconut water, smiled, then handed it back to me without saying a word. If you like Indian Sweets, especially if you like Bengali Sweets (the best, although I’m biased), K.C. Das is a must visit if ever in Kolkata (for the original) or at other locations in India. K.C. Das is famous for their roshogollas (a.k.a. 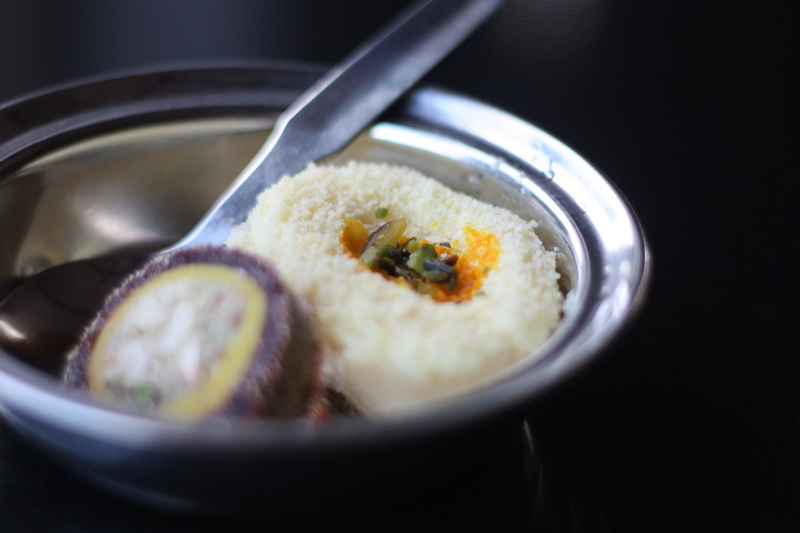 rasgullas), but I’m partial to the Bengali classics of Payesh (similar to kheer, but better) & Sandesh. All I need now is to figure out how to get K.C. Das to open up in Seattle so I don’t have to wait for the next time I am in India! As a Midwesterner, cooking with beer is very important. What’s a better way to spend a Sunday than grilling up some porter marinated meat kebabs? Toss in some whole garlic, sesame seed, and porter in with cubed red meat of your choice for up to an hour. If you love “the pain” of chili peppers like I do, you can throw some of those in as well. Then, skewer the red peppers, garlic cloves, and cherry tomatoes with the meat and cook on the grill or under the broiler. Baste with additional (fresh, not the used marinade) porter as necessary and cook until desired doneness. Quick Tip: Marinades don’t penetrate very far past the surface for red meats. You could poke the meat with a fork to create pathways for the marinade to get deeper into the meat, but then you’re also pushing surface bacteria inside, meaning you need to cook the meat more thoroughly. Marinades also prevent red meat from browning on the outside, but they do create a delicious glaze. 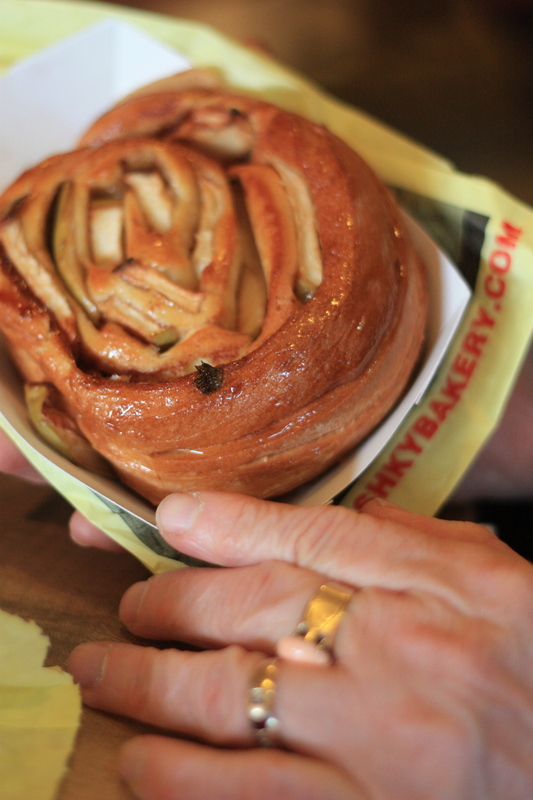 Another weekend away from Seattle, and I’m missing a my weekend morning stroll around Pike Place Market, usually including a stop at Piroshky Piroshky, a delicious Russian Bakery. Apples + cinnamon + butter = breakfast of champions, no? One of the classic dishes of my youth is Chingri Macher Malai Curry (shrimp in a Bengali coconut curry sauce). 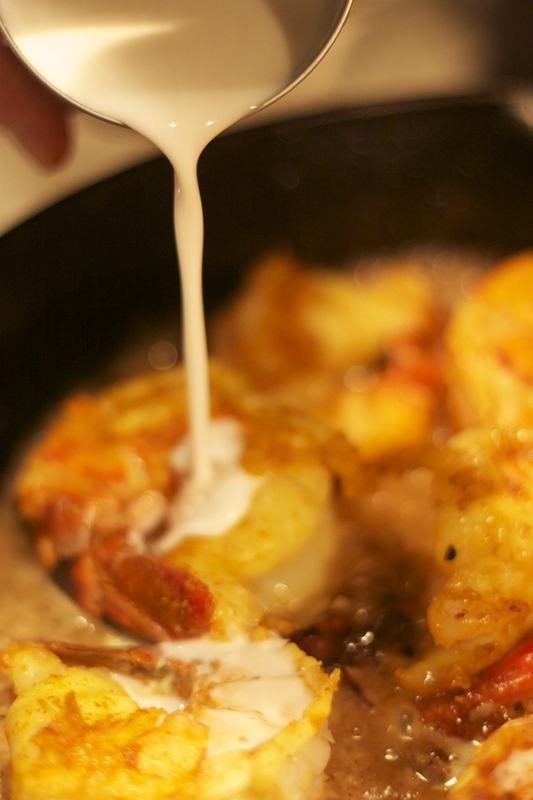 The photo to the left shows the dish, just at the point where the shrimp is about to bathed in delicious coconut milk. But before that, you have to sauté the shrimp, then the puréed onions & ginger & spices, then place the shrimp back, then you can add the coconut milk. At least, this is the vague outline of my father’s secret family recipe. The smell of simmering coconut curry is one of the most comforting and instantly peaceful things I can imagine. But, food is changing. I recently decided to read Modernist Cuisine from cover to cover. I’ve poked around within the 2,438 glorious pages, including a quick stop at the discussion on Indian curries. I see a lot of compatibility between Bengali food and Modernist Cuisine. I wonder how I can I incorporate “high tech” cooking into a traditional one: Bengali. The smells and methods of crafting Bengali dishes are interwoven with many memories. 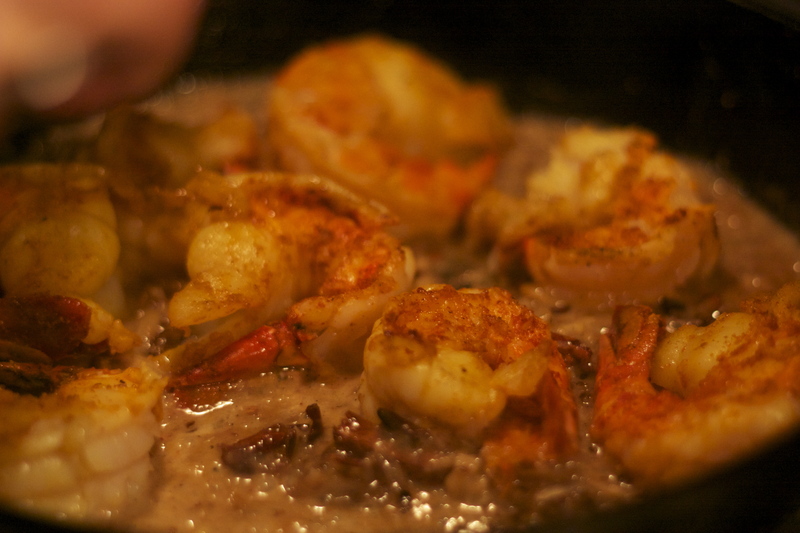 When I think about cooking the shrimp sous vide, will I miss the sounds of the shrimp sizzling, the wafts of changing smells as it sears? Or will the way I form or call upon memories associated with my food change in new and exciting ways, just like my Kindle did for reading, even though I love the feel of paper? For any culture, any person, you can always find a connection through what they love to eat. Food also connects me to myself: It reminds me of people I love, places I learned from, and sometimes, things I forgot to do. Is it possible to innovate on the foods of my youth without losing my passion for connectivity? I believe so. Modernist Cuisine focuses on improving the dialogue between chefs, (both professional and home), and eaters through food. I’m excited to see how it helps me transform my traditions. Now, just to get myself a better sous vide than my beer cooler hack and get cracking on a more upscale DIY version. A) More indulgent, cheesy potatoes (scalloped, gratin dauphinois). Thinly sliced, layered with cream and cheese (e.g., 1:2 ratio cream:gruyère), salt & pepper, baked at 425 until golden brown, usually around 20-30 minutes. A) Healthier, tossed in 1 tbsp olive oil & oregano, oven roasted at 425 for around 15 minutes.